A method for the efficient re-binning and shading based correction of intensity distributions of the images prior to normalized mutual information based registration is presented. Our intensity distribution re-binning method is based on the K-means clustering algorithm as opposed to the generally used equidistant binning method. K-means clustering is a binning method with a variable size for each bin which is adjusted to achieve a natural clustering. Furthermore, a shading correction method is applied to reduce the effect of intensity inhomogeneities in MR images. 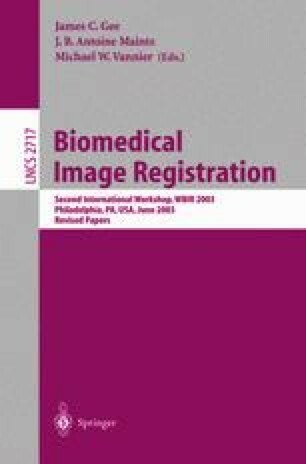 Registering clinical shading corrected MR images to PET images using our method shows that a significant reduction in computational time without loss of accuracy as compared to the standard equidistant binning based registration is possible.